Lyric Opera of Chicago has a special place for Bellini’s bel canto masterpiece I puritani in its collective memory; it was part of the company’s second season in 1955. Leading the cast as Elvira was none other than Maria Callas, who had made her U.S. debut at Lyric one year earlier in another Bellini gem, Norma. Since the company premiere of I puritani in 1955, Lyric has staged the opera only three times: in 1969, 1991, and now in 2018. 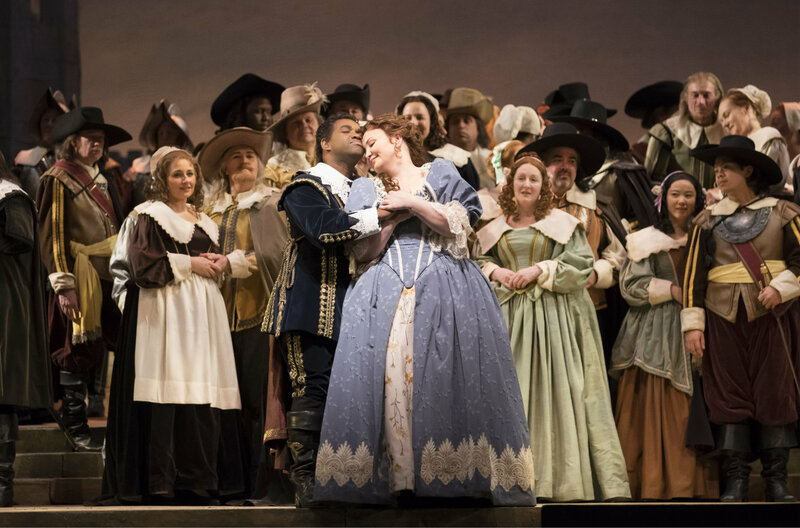 I recently had the great fortune of experiencing Lyric Opera of Chicago’s I puritani. The production, which is owned by The Metropolitan Opera, is very much what we’ve come to expect from the Met – traditional and big. The costumes and set pieces fit the time period, and very little is left for the imagination to fill in. And that’s fine. I simply personally prefer a little more inventiveness and challenge. Nonetheless, the set and costumes brought the most powerful elements of the production to the fore: the singing and the orchestra. Playing Elvira was Russian soprano Albina Shagimuratova, who played the title role in Lucia di Lammermoor last season at Lyric. The coloratura soprano made light work of the demanding role, leaping gracefully and confidently, always with an innate sense of pitch and a picture-perfect vibrato. Her decrescendos gave me chills as they evaporated into nothingness. Opposite Albina was American tenor Lawrence Brownlee as Arturo, the leading lady’s lover. Lawrence is becoming a regular at Lyric, having appeared at least once each season since his company debut during the 2015/16 season. Arturo is a different beast, however. Fortunately, Lawrence was up to the task; there are two very noticeable stratospheric notes in the score for the role, but they were no match for him. His tone is one of sheer beauty – perfect for bel canto. There were moments in the tenor’s interpretation, however, that gave the impression of being a bit too conscious of technique, most often in particularly challenging portions of the score, such as those requiring perfect cohesion with multiple moving parts. That said, he was a wonderful Arturo and I hope to continue to see him on stage at Lyric in seasons to come. American baritone Anthony Clark Evans, a Ryan Opera Center alumnus and Lyric regular, played a convincing Riccardo, another role in the opera with a lot of meat. Though at times early on in the production I felt as though he were holding back a bit too much, there’s no doubt that he has a formidable baritone. 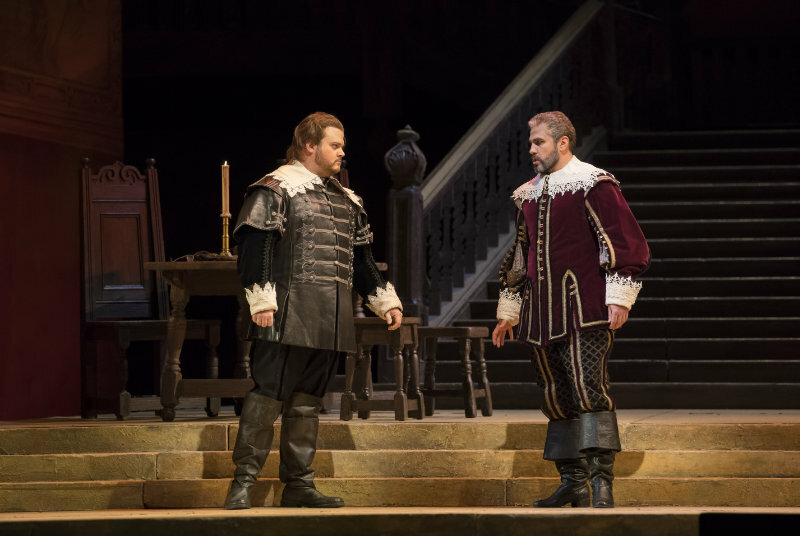 Alec Carlson, a current member of the Ryan Opera Center, played an attentive Bruno, while Romanian bass Adrian Sâmpetrean played a loving yet powerful Uncle Giorgio Walton. Adrian has a commanding stage presence, as well as a muscular sound. His quick vibrato was a bit distracting for me personally, but he fit the part and played it well. 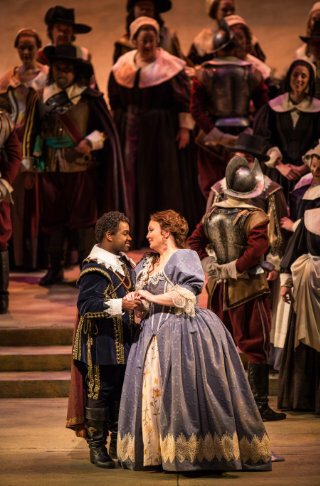 American contralto Lauren Decker – another current Ryan Opera Center member – was a fantastic Queen Enrichetta with her robust voice and prominent stage presence. Leading the Lyric Opera of Chicago orchestra was Italian conductor Enrique Mazzola. I was fortunate to have had the chance to interview the maestro before attending the performance. I puritani is Enrique’s second production at Lyric, following the wonderful success of last season’s Lucia di Lammermoor. My only complaint in I puritani was balance; the orchestra covered up the singers a bit too often. The orchestral sounds themselves were glorious, but in bel canto, it’s the human voice that reigns supreme. One unconventional feature of I puritani at Lyric that had nothing to do with the performance itself was something we don’t often experience as audience members: during the second intermission between Acts II and III, the curtain remained open and two Lyric staff members came to the stage and spoke about the currently unfolding changing of the set. It was fascinating to witness the complexity of the operation and the sheer number of people involved in the process. I had no idea! Overall, Lyric provided its patrons with another beautiful evening at the opera – just what you hope for when attending a work like I puritani.